Plymouth Argyle boss Derek Adams has been impressed by the Cobblers’ performances this season, likening Town’s spirit to that of his own table-topping team. Leaders Argyle host second-placed Cobblers at what is sure to be a packed out Home Park on Tuesday night, and Scotsman Adams is anticipating a difficult evening for his team. 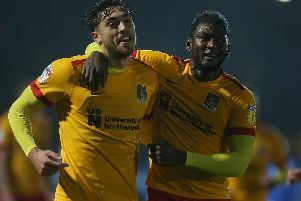 “I think that Northampton played very well on Saturday to get a draw at home to MK Dons, and get another shot at playing in the next round,” said Adams, who is also impressed at Town’s loan signing of striker James Collins . “They’ve taken in Collins from Shrewsbury, so they’ve added to their strike force. I think that throughout their team, they’ve got good spirit and continuity like we have. “They’ve done really well this season. They’ve been able to pick up a lot of wins. Tuesday’s game has been rearranged from Saturday due to the Cobblers’ FA Cup commitments, and that switch is going to affect how many Town fans are going to be able to make the long journey to Devon. But Adams is expecting the home support to come out in force, and is looking forward to an exciting game. “We’ve been on a fabulous run this season, and we’re looking forward to another big game coming to Home Park,” said the former Ross County boss. “I think it’s a good game to have. We’ve already had very big games this season and we’ve been able to perform well. “We take every game in isolation, and it’s important to win every game we play in. But there’s 21 games left in the season, and every one of them are big games, so there is that excitement for the fans and the players.